Last fall, a badgeless version of the Pontiac G8 sedan, complete with twin-port grille, was released for limited sale in Australia. The Aussies liked it so much that it's now an ordinary production model. Vegemite excitement, anyone? Stick with us here, because the details are everything: Late last year, Australian carmaker and GM property Holden began selling a variant of the Pontiac G8. The car in question was a limited-edition version of the high-performance Commodore SS-V, one sold as a Holden but fitted with G8 bodywork. The model was intended to be a quick way to clear out Pontiac parts inventory, but sales surpassed expectations, and it's now a regular production model. 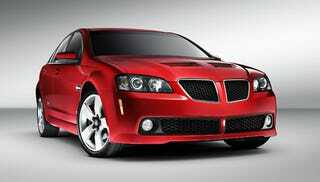 If that weren't enough, Australian dealers are reportedly ordering Pontiac badges and trim for enthusiastic customers. So a Pontiac that was once a Holden is now a Holden that may be a Pontiac again. Even if Pontiac is dead. Confused yet? Here's the take-home: That's not a knife — this is a knife. Six foot tall and full of muscles. Beer flows, men chunder; women glow, men plunder. You better run. You better take cover! MidnightoilINXSwhatthehellisawolfmotherLongLiveBonScott.